MILPITAS, Calif. - Nov. 28, 2018 - PRLog -- Inorganic sulfate ion is one of the most abundant polyatomic anions in ammalian body fulids and it is essential for the synthesis of many biomolecules such as glycosaminoglycans, choline sulfate, steroid sulfate, cerebroside sulfate and heparin sulfate. Some biomolecules having a sulfate moiety can activate or assist detoxification processes of drugs, steroids, neurotransmitters, bile acids, food additives and heavy metals. In humans, sulfate ions are mostly absorbed by kidneys and little is excreted into urine. Sulfate deficiency can lead to fetal underdevelopment, autism osteochondrodysplasia disorder. Therefore, the estimation of physiological concentrations of sulfate in human is critical. BioVision's Sulfate Assay is a simple, fast and accurate assay to determine sulfate concentration in biological fluids such as serum and urine samples. The detection reagent in the kit specifically reacts with free sulfate ions present in a variety of biological samples. The signal is measured at OD 600 nm and is proportional to the amount of sulfate up to 2 mM. BioVision's Sulfate Assay is suitable for the detection sulfate ion in serum and urine samples and it can detect as low as 0.1 mM of this ion. 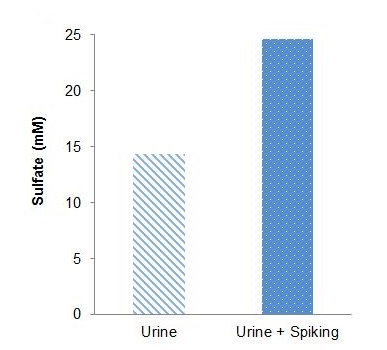 Figure: Sulfate concentration determined in non-spiked and spiked (10 mM sulfate) urine samples. A spike recovery higher than 97% was obtained in both samples using kit protocol.